In a major victory for African wildlife, Governor Jerry Brown signed AB 96 on Sunday to close a loophole in the state’s ban on importing and buying elephant ivory. California is the third state to ban all sales of ivory after New York and New Jersey. The state is one of the largest U.S. markets for the product. “In California it’s particularly important because of the large population of Asian immigrants,” said Grace Ge Gabriel, the International Fund for Animal Welfare’s Regional Director in Asia. 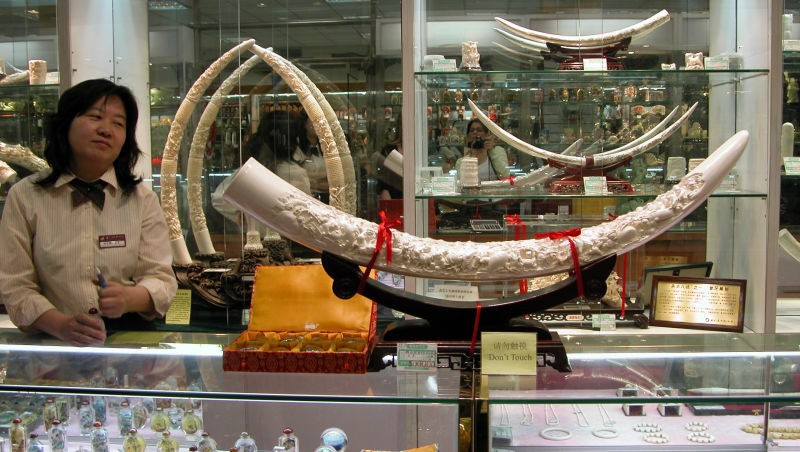 Second only to Los Angeles, San Francisco sells the most ivory in California. The city's Chinatown sells trinkets like jewelry, chopsticks, carved horns and statues. California has already had an ivory ban on the books since 1977. Until now, shopkeepers were allowed to sell ivory that was imported before 1977. But many store owners have exploited this exemption, claiming their products were imported before 1977. Since it's impossible to "date" ivory, it's been difficult to tell which ivory is new and which was imported decades ago. In fact, before the new ban, 80 percent of ivory sold in San Francisco was likely illegal under state law, according to a National Resources Defense Council study. Supporters of the legislation say banning nearly all sales will reduce demand for the product and make it easier to control. Worldwide, more than 30,000 elephants are killed each year for their tusks--nearly 100 elephants a day. Poachers sell the lucrative ivory for thousands of dollars per pound. Increasingly, militias and criminal gangs in Sudan, Uganda the Democratic Republic of the Congo sell ivory to purchase weapons, according to IFAW. “This ban is going to stigmatize purchasing ivory, and that's what will help change behavior,” said Ge Gabriel. The California bill, authored by Assembly Speaker Toni Atkins, D-San Diego was co-sponsored by the Oakland Zoo. It goes into effective July 1, 2016, with fines up to $50,000 and a year in jail for illegal sales.